A really good men's suit fits the body like a glove. We will help you to find it with some tips. Because of the different structures of male bodies suits can have at least 54 different silhouettes. When you add 11 sizes and 3 heights the possible combinations are 1782. Due to that huge number, every company specializes in specific shapes, but always in all 11 sizes and 3 heights. If the coat doesn't fit perfectly to your structure, do not believe if the shop assistant is trying to convince you that it can be fixed - without the original proportions set out in the design, it will lose its perfect appearance and convenience. If the coat is slightly loose and with relaxed hands you can grasp its hem - this is certainly your size. And remember that the sleeves should end gracefully at the base of the wrist and the curve to coincide with the center of the shoulder joint. That way you will avoid the feeling of tightness in movement. The collar should fit the neck and lapels - the body. The emphasized waist gives a stylish look, even at chubby gentlemen. If you are one of them it's best to choose a model with two vents. 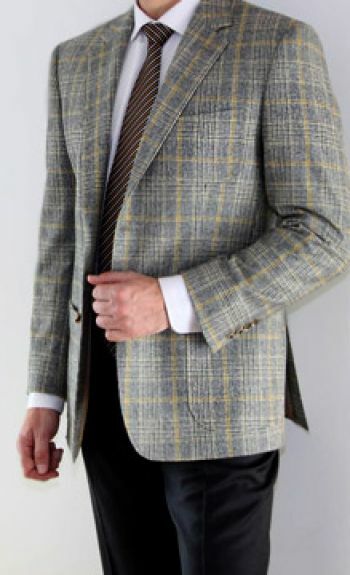 Once you have selected the appropriate jacket, adjustments in trousers are available in width and length. The distance between the waist and the belt must be two fingers, the length to reach the middle of the heel and the front part to lie down with a refraction.